Necrobump. And with good reason. For today I heard that Peste Noire had become even better. By now, it should not be much of a secret that I’m a great admirer of this French group, as it is one of the few black metal bands left that still seems to have testicles. But for now, just imagine asking me about five months ago which musician I would have liked to see perform with Peste Noire one day. Without a shadow of doubt, I would have said Ardraos. I have already written about this master-of-all-trades in my review of the first full-length of Sühnopfer, Ardraos’s very noteworthy one-man-project. 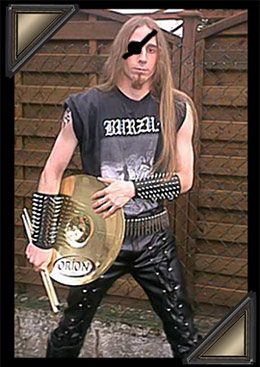 For those who do not know about him yet: it is safe to say that he is a truly magnificent drummer that stands far above the usual blastbeat machines that plague the black metal scene, outmatching them easily in both originality and pure skill. As such, while listening to Peste Noire, I have actually wondered more than once what the already supreme music of the band would sound like with Ardraos behind the drumkit. An artist’s impression of Ardraos’s Peste Noire endeavour. And would you know, today I found out that Ardraos is actually going to handle the drums on the next album of Peste Noire(!). He reveiled this himself on his Lamebook account. This news is interesting not only because it pretty much confirms that the drums on the next PN album are going to be terrific, but also because we now actually know that the band is working on a new album, or at least thinking about it. And seeing as every full-length effort of the band has been something special so far, with a little luck, we might have another PN-effort dominating our CD-players in about a year. Hopefully, this rather honourable job will also get Sühnopfer some more recognition. This way, I can say that I was into Sühnopfer before they became cool. The horn-rimmed hipster glasses have already been ordered. Allright, this is my favorite blog from now on.